Hey there, everyone! So, weren't the samples for Gnome Sweet Gnome the cutest?!! I loved how different all of our cards were...and I think we used up every single image and sentiment in the set for you all to see! And didn't the set just go perfectly with how fun and bright the new Lawn Fawn papers are? Loving it! Today we are showcasing the Bright Side papers again! Because it is a completely new product line for Lawn Fawn, we want to make sure you get plenty of inspiration for it! So that when you get these new papers in your hands you will be so excited to use them! I wanted to show how these papers can be used for a sophisticated and elegant card today...because while they are super cute for the most part, there are some patterns & colors that are sleek and sophisticated. Like the grey chevron prints, which are so trendy in everything right now... and you would never know that there is a super cute flower print on the purple paper when folded into an accordion shape. They paired perfectly with this clean and graphic sentiment as well. Here is what I created! Instructions: Make card from shimmery silver cardstock. Cut large chevron paper slightly smaller and adhere to the front. Cut a banner edge to a strip of small chevron paper, and adhere to the left side. Punch a scalloped border to purple patterned paper, then cut a 1-inch strip. Scor the paper every half inch, fold back in forth in an accordion. Adhere each end together, fold in to make the flower shape, then adhere to a square of cardstock. Repeat the accordion fold with a smaller strip of chevron printed paper. Thread two buttons with twine, then adhere to the top of each accordion flower. Tie a bow from green dotted ribbon, then layer the accordion flowers, the fabric flower and the ribbon to the front of the card. Stamp the sentiment to a thin strip of white paper, cut banners on both edges and adhere to the bottom. Accent the background banner with three jewels to finish. Wow !!! I love it ! Beautiful card. Love the mix of all the papers and your flowers are fabulous! such a beautiful card. Love the chevron! Wonderful card - great Design. Thanks for joining Stamp with Fun. beautiful! 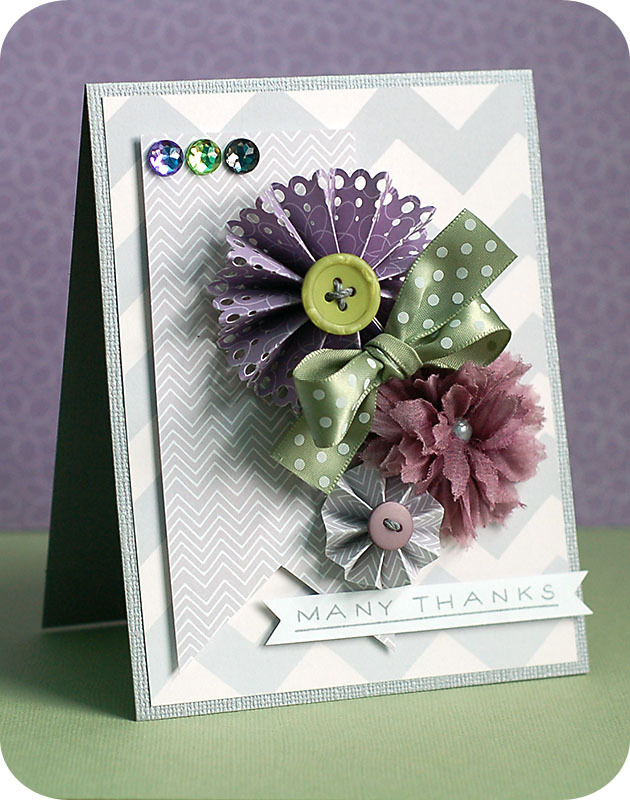 just love the tone color and the use of colorful elements to brighten the card. Love this card!! Beautiful!! Thanks so much for playing along with us at Frosted Designs! thanks for joining us this week at Diva's. What a pretty card!! Love the colors and the chevrons! Your rosettes are pretty too!! Love this card. I love purple to began with. I am so excited to try and make that purple flower. The paper is great all of it, but was pleasantly surprised by these colors. Gorgeous card! Love your colors and the flowers! Thank you for participating in the Creative Belli Challenge. I love the softness of colors for the card base. It really makes an emphasis on the flowers. Beautiful. Wow what a gorgeous card!!!! Very pretty and cheerful! Love the 3 gems! I hope you'll join us again at Frosted Designs! Beautiful card! The person that receives this lovely card will be delighted. Thank you for playing along at Frosted Designs! A stunning creation and I particularly love the flowers. Thankyou for entering this into the Allsorts Challenge this week. Very pretty flowers and love the bling! Thanks for participating in the Creative Belli Challenge.